Photo: Peakaboo! 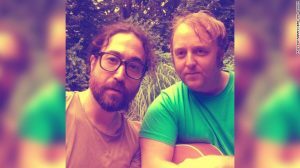 Sean Ono Lennon and James McCartney posed for Instagram. Hey, Jude — John Lennon and Paul McCartney’s kids are friends. Sean Ono Lennon posted a selfie Monday with James McCartney. Like their famous dads, the pair are both musicians. Sean is the son of the late John Lennon and artist Yoko Ono, and James is the son of Paul McCartney and the late Linda McCartney. “Peakaboo…,” Lennon captioned the photo. It’s not the first time Sean Ono Lennon has hung out with other Beatles progeny. Last year he was photographed with James’s sister, designer Stella McCartney, at her pre-fall fashion show in New York City.